The latest battle brewing in the Southland charter school debate erupted this week, when nearly 100 parents, teachers, students and other community members gathered at Veterans Park, in Carson, to protest district plans to offer a portion of Catskill Avenue Elementary School to the newly formed Ganas Academy Charter School in the fall. But the protest was just the latest flare up in tensions over the co-sharing proposal. 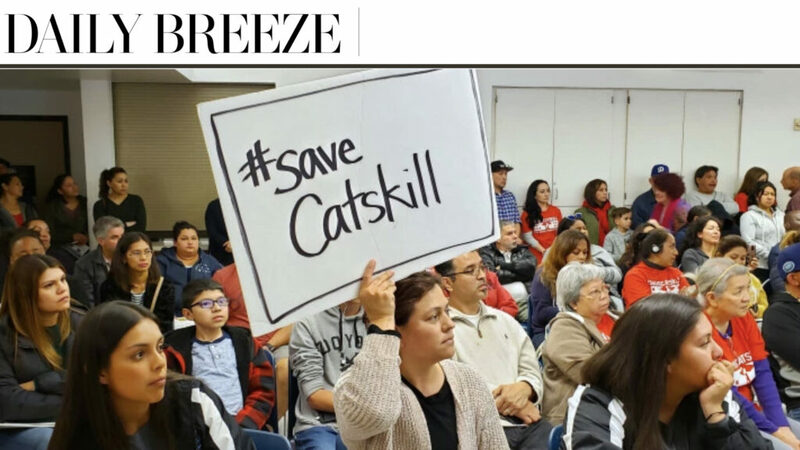 Earlier this week, multiple parents and children opposed to the charter were kept out of a Ganas meet-and-greet at a local Dennys’, leading to a brief standoff between the groups, according to Catskill schoolteacher Elizabeth Untalan and other reports. Ganas received Los Angeles Unified School District approval in June, but has yet to find a home. 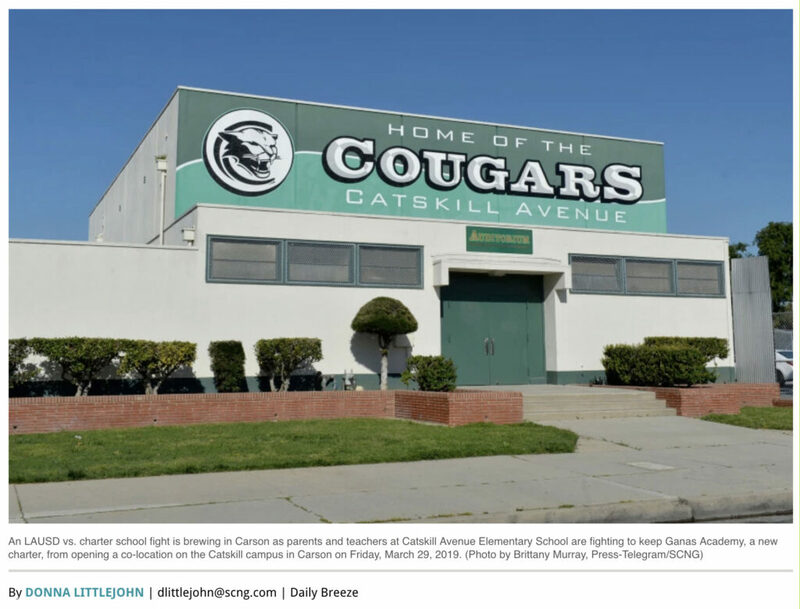 The charter school first looked at Wilmington, but then the district offered up Catskill’s campus, 23536 Catskill Ave., in Carson. Ganas will have to accept the offer by May 1. The Board of Education does not need to approve the move, but would need to authorize the funds to get the campus ready for co-location, according to the district. But the proposed campus-share plan leaked to the public in December, Untalan said, causing push-back from the Catskill community. “Co-locating will just deplete resources from the existing campus,” said Albert Ramirez of L.A. Alliance for a New Economy and Reclaim Our Schools L.A.
Untalan added that the school makes use of all of its rooms. “We’re a thriving school and our resources are needed to serve the needs of our students,” she said, noting that most of them are at-risk students. “We have three computer labs, a science lab and a counseling room and parent center. We have one empty classroom but that is utilized for enrichment. The growth of charter schools — there are now nearly 3,000 in California — were among the issues in last year’s LAUSD teachers’ strike. A co-location proposal was defeated a year ago by opponents at North Hollywood High School in Van Nuys. LAUSD Superintendent Austin Beutner and a recent majority of the school board have been supportive of charter schools. Proponents like charter schools for the choice they offer parents and students. But opponents, who are growing more vocal with strong union support, say they rob public schools of dollars, students and facilities. Fall 2019 enrollment, according to the school’s website, is open for transitional kindergarten and first-grade — but no location is listed. The school’s founder is named Sakshi Jain. The vice president of the school’s board of directors,however, is Gaetano Scotti, of Torrance, who is more commonly known as Tom Scotti is a former principal of the Port of Los Angeles High School, in San Pedro, where the Ganas has held its board meetings. In a telephone call, Jain declined to discuss the school’s possible location, saying those decisions are entirely up to LAUSD. But she did say the academy had “no choice” in any campus-sharing plan; Jain — who led the math department at a New York City charter school and was assistant principal at a San Pedro one — added that she would only talk about the school’s academic mission. The co-location arrangement is allowed under California’s Proposition 39, which voters passed in 2000. It requires school districts to offer equitable and adequate unused public space to area charter schools. While co-sharing has been implemented at other LAUSD campuses, it is relatively new in the Harbor Area and southern part of the district’s territory. And move-in agreements nowadays don’t come without a fight, as the teachers’ union has doubled down on limiting any territory charter schools — which the union views as competition — receive. The status of a possible Catskill-Ganas campus arrangement, however, remains unclear. A statement provided late Friday, March 29, by an LAUSD spokesman did not address the Carson or Ganas specifics, but pointed out that the district operates the largest shared-space program in the state and has a legal obligation to see that all students have a place to learn. Untalan, though, said the academy has made little effort to make inroads into the community.